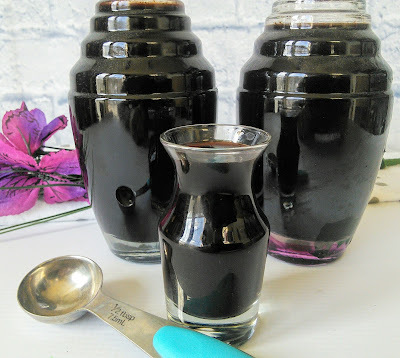 This homemade elderberry syrup is great for cold & flu season! This has been a tough season for colds and flu. Thankfully my family has escaped the flu but we did suffer through a nasty cold virus. My youngest has had some sort of bug three times while the other boys only had one cold. Even this mom who never gets sick had a one day of feeling sick with a sore throat. I am glad that the boys recovered quickly from this bug. My sickness only lasted a day. I credit my family quickly getting well from the use of elderberry syrup, vitamin C, and my honey lemon ginger tea. I ingest all these natural remedies, several times a day, at the first sign of a cold and I always feel better the next day. My boys have not learned the signs of a cold coming on yet so there colds usually last a couple of days compared to my one day. I ran out of the elderberry sample that I received from a conference last year so I decided to make my own elderberry syrup. I was surprised at how easy it was to make and so much cheaper than store-bought. Elderberry: A Natural Remedy for Mild Colds and Flu? Elderberries naturally contain A, B, and C and stimulate the immune system. These dried berries are naturally high in immune-boosting compounds that are specifically shown to help beat the cold and flu more quickly. I like to use natural remedies for colds as traditional medicines only relieve the symptoms. A natural remedy like elderberry instead helps boost the immune system so your body can fight the germs. 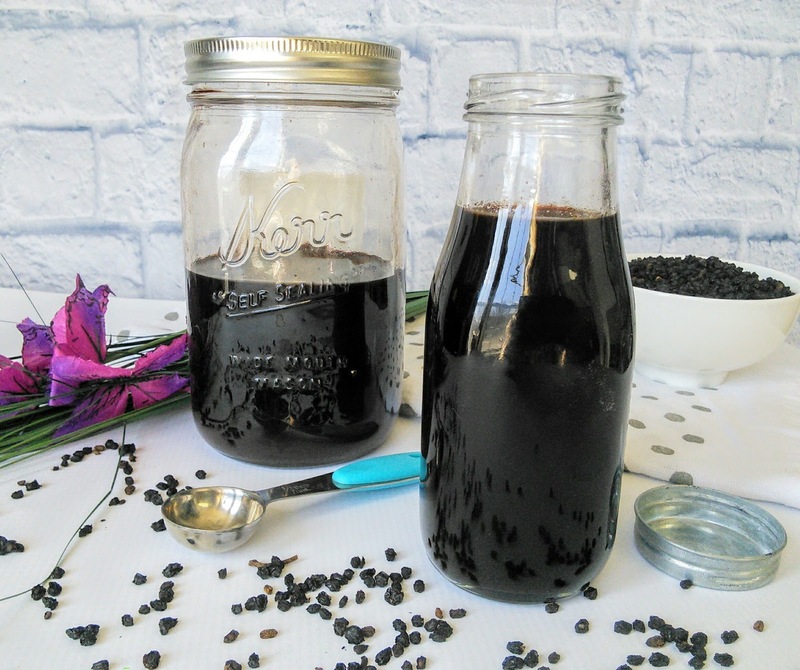 Elderberry syrup provides the concentrated immune-supporting benefits of black elderberries in a great-tasting way. My homemade recipe uses homemade elderberry concentrate with herbs like cinnamon and ginger, plus raw honey for not only taste but for an extra immune boost. I got my dried elderberries online but you can find them also at health food stores. Since you only need 2/3 of a cup to make a batch, the dried berries make several bottles of elderberry syrup. Put all ingredients, except honey in the pressure cooker pot, seal lid, and set manually for 9 minutes on high pressure. Vent pressure and mash the berries carefully using a spoon or other flat utensil. Pour through a strainer into a glass jar or bowl, discard the elderberries. I like to strain my syrup through a wire mesh strainer and I also press on the berries with a spoon to get all the liquid out. When the syrup has cooled stir in the honey. Store the syrup in the fridge. 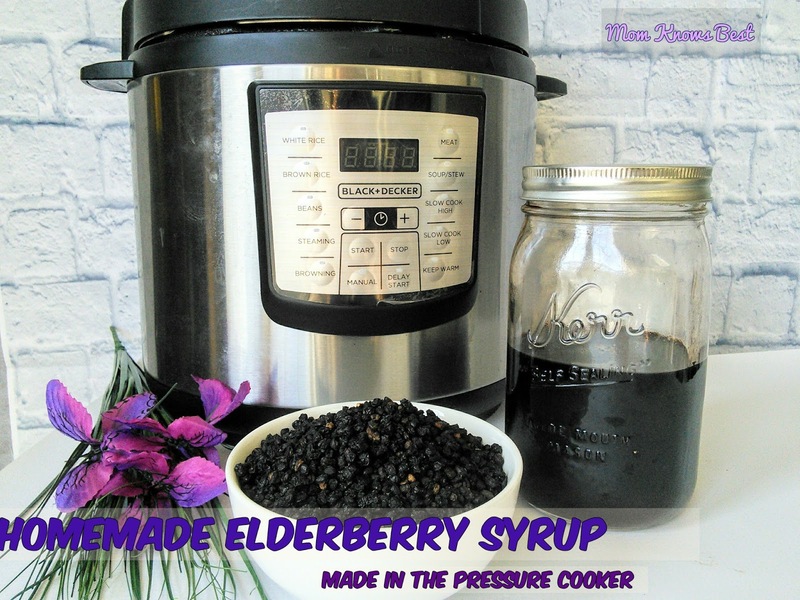 You can also make the elderberry syrup on the stovetop if you don't have a pressure cooker. 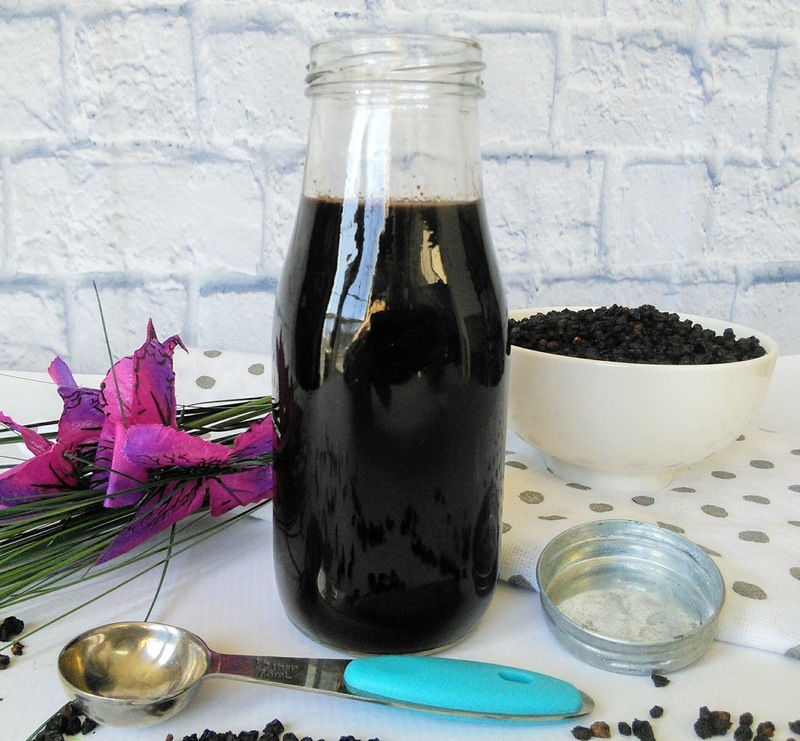 Elderberry syrup is also great for a daily immune booster! The standard dose is ½ tsp to 1 tsp for kids and ½ Tbsp to 1 Tbsp for adults. If the flu does strike, take the normal dose every 2-3 hours instead of once a day until symptoms disappear. You can also make delicious gummies with the elderberry syrup. 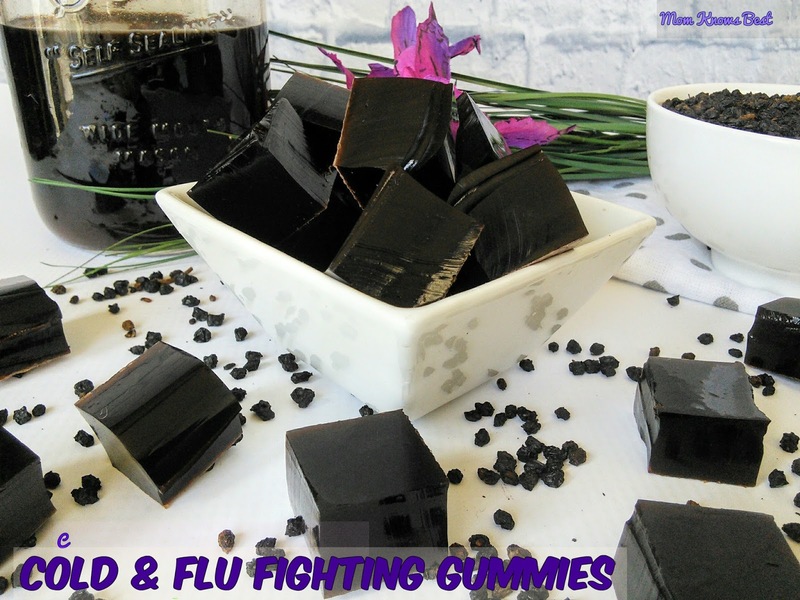 Make sure to check out my recipe for these delicious Elderberry Cold & Flu Fighting Gummies! Oh my goodness I bet this is absolutely amazing I wouldn't have thought of making anything like this at home! But I bet it is just the best. This sounds amazing! I have never heard of this before, thanks for sharing! I would so love to try elderberry syrup! I just got a new pressure cooker too! I have not heard of elderberry syrup before. This looks like some tasty stuff! Excellent - I am always looking for more ways to use my pressure cooker. Thanks for the idea! This is amazing! I will send this to my Mom. She enjoys making homemade stuffs. Looks tasty!